How to share project with selected people? Can you share a private project with your partner? Can your partner modify your designs? Yes, you can use Add Member to do this. 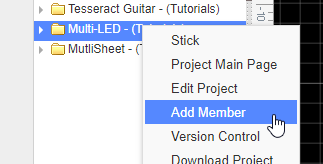 Right click the project and you will see the Add Member on the context menu; clicking on it will open the Add Member webpage. The project member you can set as “Developer”,”Manager”,and “Observer”. After setting up Add Member and Permissions, your partner will find your project in the Project section from the left Navigation Panel when they login. If you partner doesn’t wish to accept the shared project, they can reject it by leaving the project when they enter this project “Add Member” function.